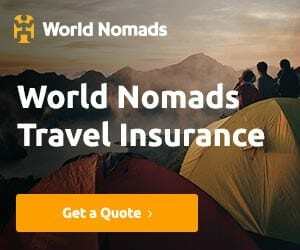 When I think of Turkey, the first two things that come to mind are the swept-me-off-my-feet fairytale chimneys of Cappadocia and the comforting taste of hot bread dipped in fresh minty hydari. Even before I’d set foot on Turkish soil, I was extremely excited about the cuisine from what I’d read (and obsessed over) for the weeks leading up to the trip. 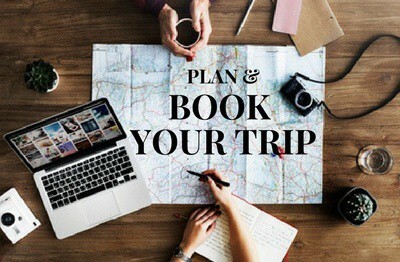 My taste buds, accustomed to all the goodness of Middle Eastern dishes and mezze (cold dips and appetizers), were looking forward to the infinite culinary possibilities in a food culture that brings together Mediterranean, Central Asian and Middle Eastern influences among others. This being my first brush with Turkish cuisine, I stuck my fork right in with an open mind and a hearty appetite. 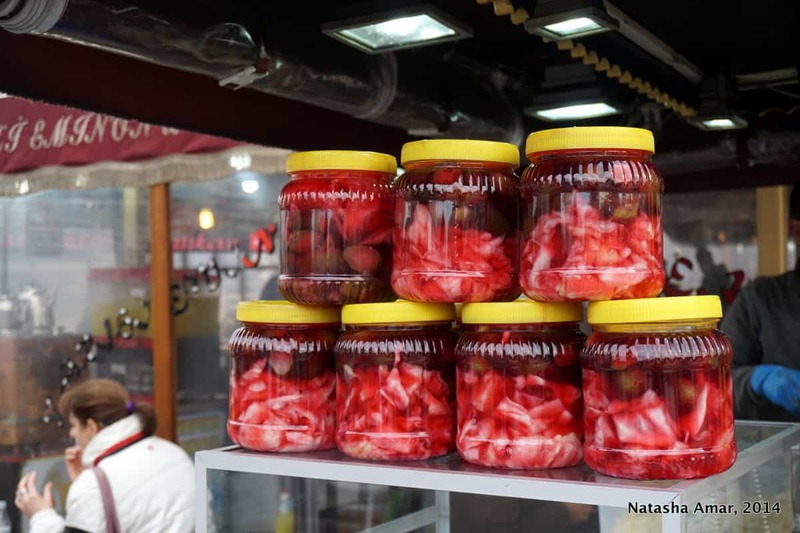 On this trip, I visited Istanbul, Cappadocia, Selcuk, Pamukkale and Ephesus and was pleasantly surprised by differences in regional cuisines that were often subtle. Perhaps the need to cater to tourists in Istanbul has resulted in a large number of places serving Doner Kebaps, Pide and wraps, but a little patience led me to a few great hole-in-the-wall restaurants, some of which did a fine job of not only Turkish but also Italian cuisine. 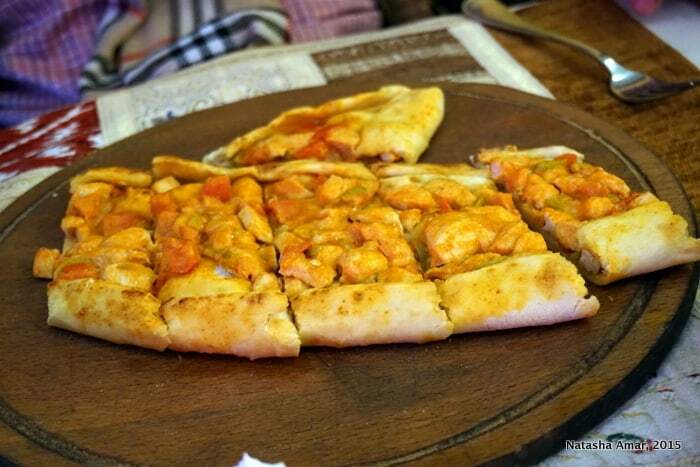 Of course, this is not to say that I did not enjoy Doner Kebaps or Pide, the Turkish version of pizza. 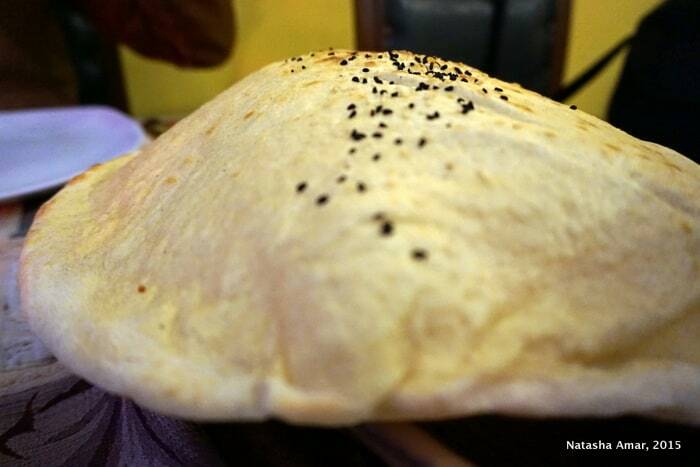 Still, my favorite food experiences are from Cappadocia. Rich in Anatolian flavors and tastes, it blew my mind in more ways than I can describe. I looked forward to every meal with equal enthusiasm, from breakfast to dinner after long happy days of hiking. 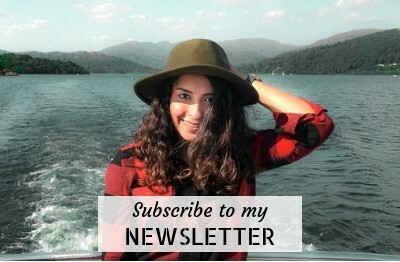 Curious about what was on my plate and my favorite food experiences in Turkey? 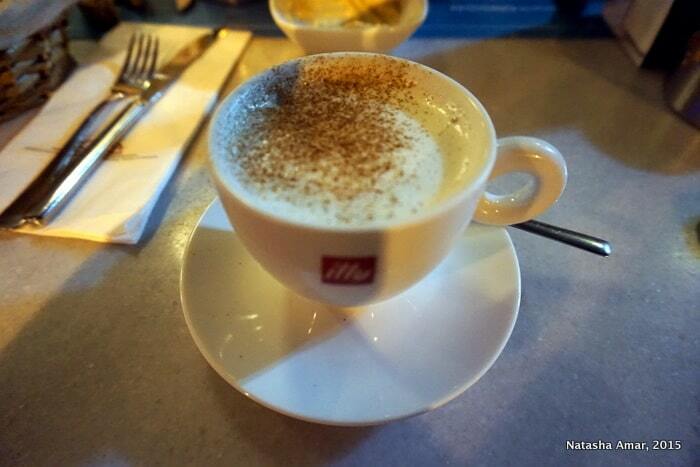 Essentially a winter comfort, Salep is a hot drink with its main ingredient being flour made of wild orchids, milk and cinnamon or nutmeg for a hint of flavor and warmth. The texture is rich and creamy and it does an excellent job of chasing away the chills on a winter evening. The popularity of Salep, an Ottoman tradition, has led to the decline in the growth of wild orchids and the subsequent ban on export of salep flour outside Turkey. Dondurma or Turkish ice cream, made of milk, salep, sugar and Arabic gum is famous for reasons other than its taste and unique texture, which are also quite great. But the Dondurma experience, in great part, is about the craftiness of the Dondurma vendor. 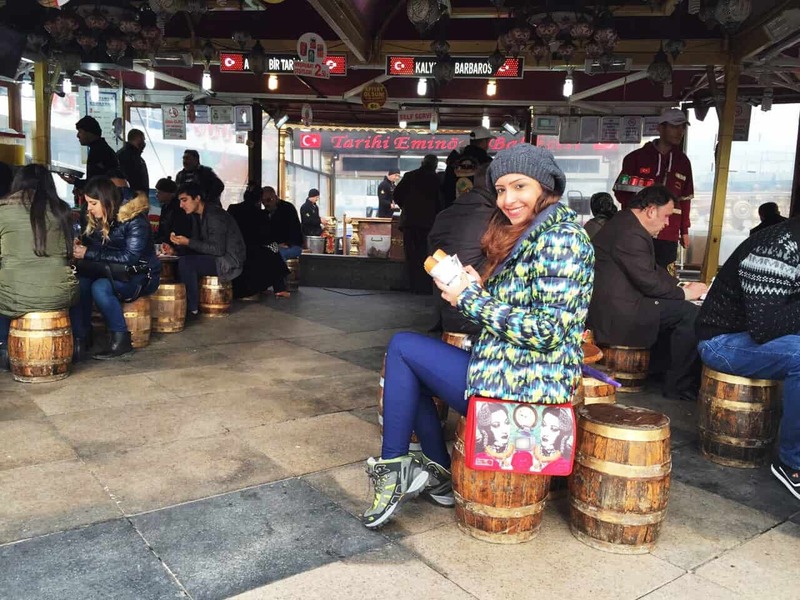 To know what I mean, watch this short video from Istanbul’s Istiklal Street and you’ll know why you absolutely have to order a Dondurma in Turkey. 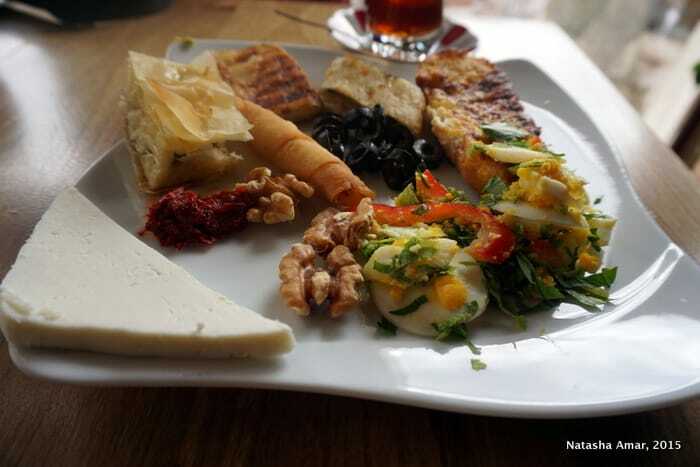 The first meal of the day is serious business (as it should be) in Turkish cuisine. 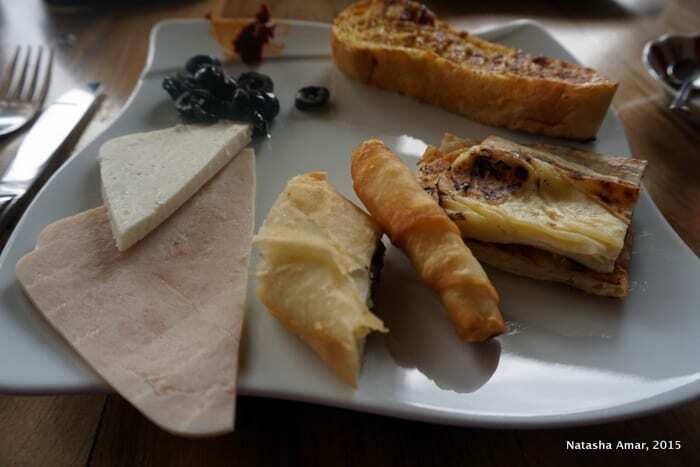 Breakfast usually consists of a selection of breads, cheese, fruits, dips, olives, salads, cold cuts, eggs, pastries, sausages, jam and honey. 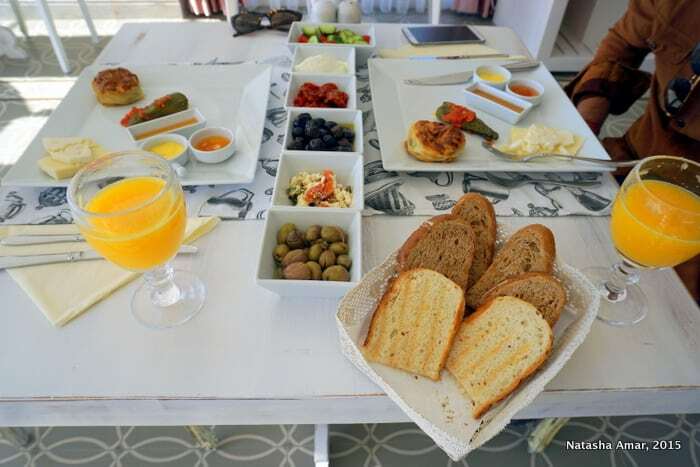 Fresh Mediterranean ingredients and the lavish spread meant that breakfast would almost always be a slow, indulgent and leisurely affair. 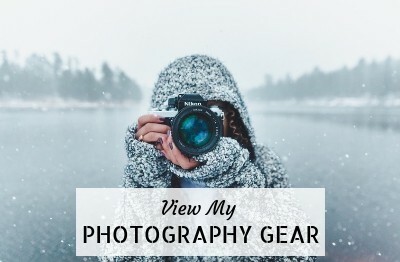 This was especially true of my mornings at the Kelebek Special Cave Hotel in Cappadocia. 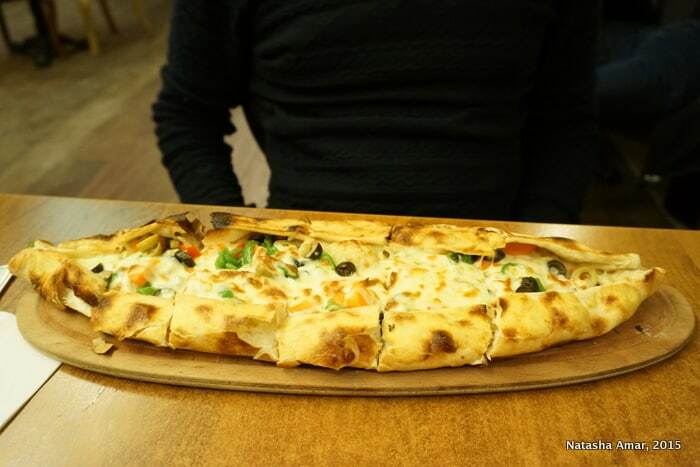 Pide (pronounced pee-DE), flat, thin, bread topped with cheese, vegetables and/or meat, is simple, delicious and tastes just like pizza minus the tomato sauce base. The dough is baked in a stone oven and the pide comes out nice and crispy. It’s a good size and is one of the most value-for-money dishes you’ll find, especially in the tourist areas of Istanbul. Maybe it’s having grown up on Lebanese food which has its fair share of cold mezze such as Hummus and Moutabel, but I love mezze and dips of every kind. Whether they’re made of feta, yogurt, eggplant or chickpeas, I love them all and luckily for me Turkish cuisine does plenty of dips. My favorite was the yogurt and mint based Haydari, which I would unfailingly order at every meal (except breakfast), as a happiness-inducing accompaniment to my meal. 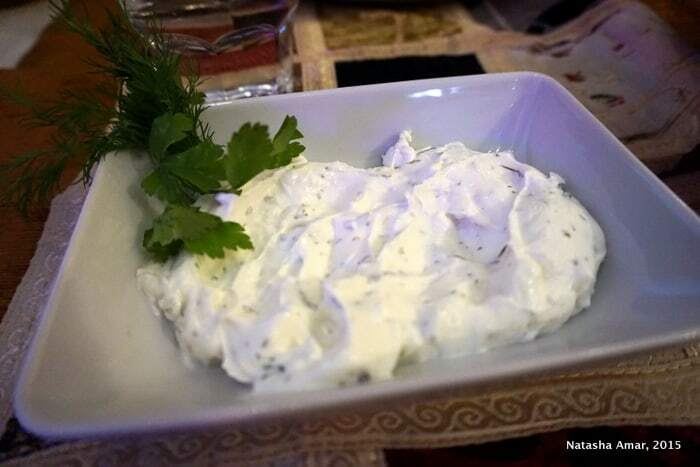 It’s made of strained yogurt, mint, garlic, olive oil and dry spices and goes really well with meat dishes like kebabs (and just pretty much everything really). I liked it so much that I even tried to make it home using this recipe and it turned out quite well. 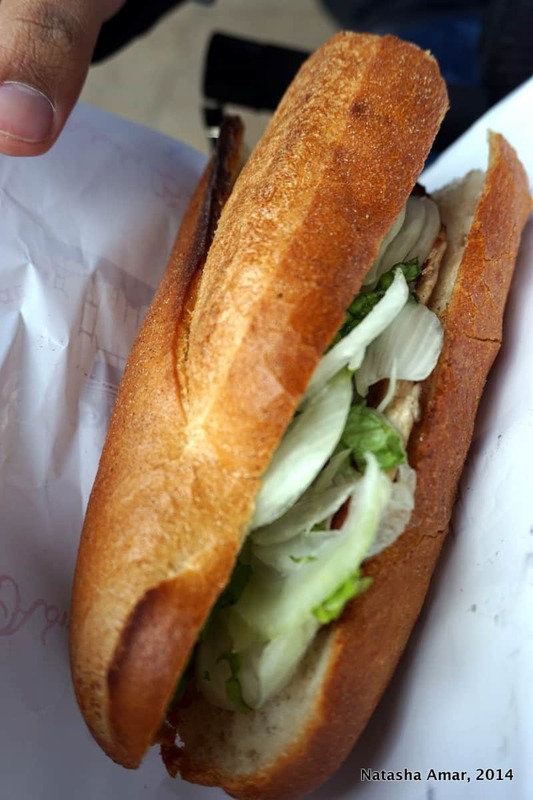 Balik Ekmek, served at one of the many boats docked along Eminonu Harbor, in Istanbul, is a sandwich of grilled fish, lettuce and onions. The fish is caught fresh, grilled on the boats and served in sandwiches to crowds of hungry commuters who come and go at the Eminonu terminal. Salgam, a blend of water, pickled carrots, turnips and boiled bulgur, is an optional accompaniment that was a tad too strong for my taste buds. But hey, if you’re feeling adventurous or curious, just go for it. For a couple of Turkish Lira, it’s a simple meal and good value for money. After you’ve chomped down your Balik Ekmek, don’t forget to cruise between Asia and Europe by getting on the Turyol ferry at the harbor in Istanbul. Generally, I’m not a fan of soup. What kind of statement is that, you say? Well, some people like me are just weird about things like soup. But, add yogurt, one of my favorite things in the world, to the equation and you’ve won me over. 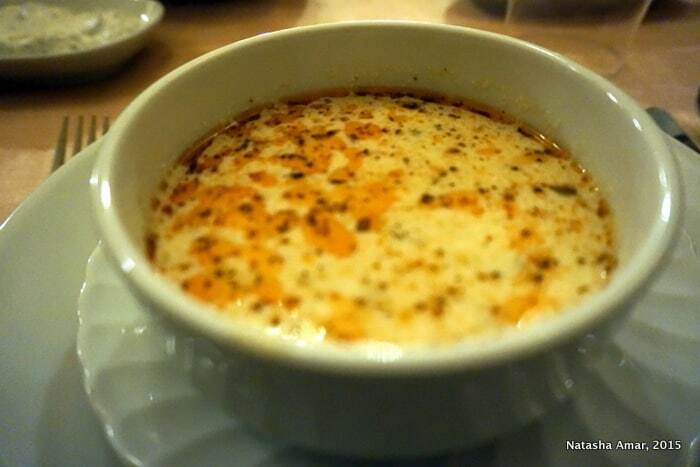 I tried Yogurt Corbasi or soup for the first time in a lovely little town in Cappadocia called Avanos and absolutely loved it. 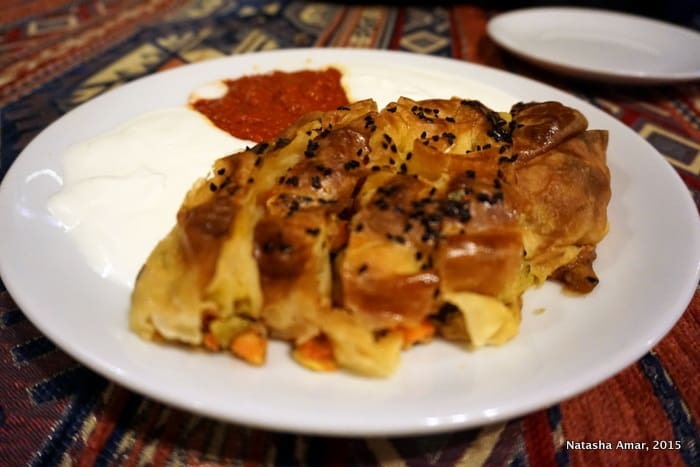 Another result of the Ottoman traditions of Turkish cuisine, Borek is an oven baked filo pastry that is stuffed with vegetables, meat and sauces and often topped with sesame seeds. Borek can be sweet or savoury, comes in various shapes and sizes and is even served for breakfast. 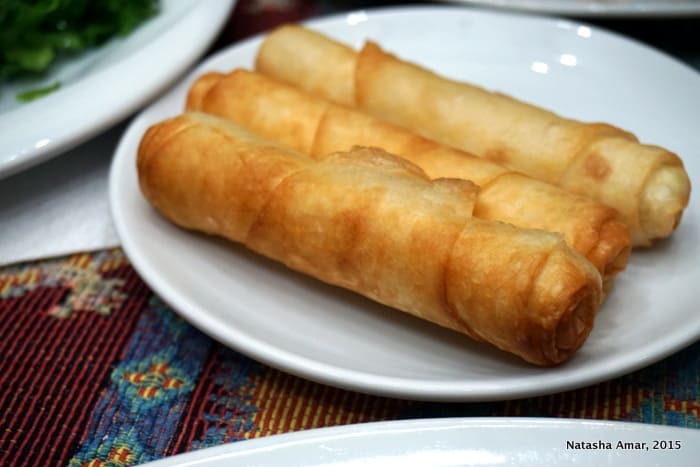 Sigara Boregi is a fried and rolled variation that is usually filled with cheese and parsley, sausage or minced meat. 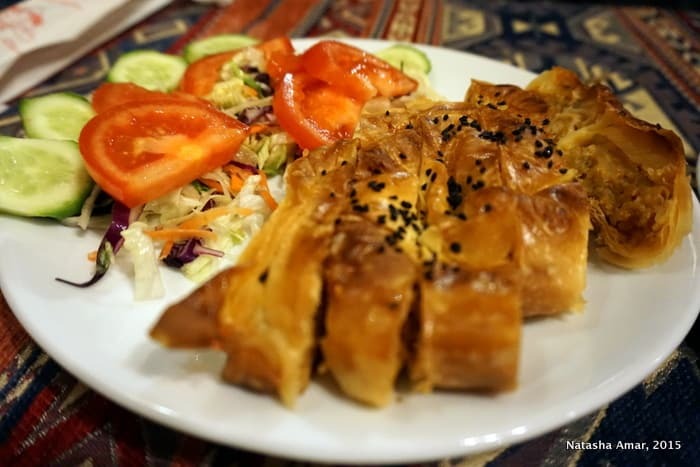 If you’re ever in Goreme, Cappadocia, I insist that you find Nazar Borek Restaurant and Café in the town center and try their amazing selection of borek. The owner is a really friendly guy and more than happy to recommend something off the menu. The place is also suitable for vegetarians. I found the place open on a chilly, rainy evening and found comfort in their delicious hot pastries, which at only 8TL were amazing value for money. I’d never tasted bulgur before and the only pilaf I was familiar with was rice, but I was pleasantly surprised by bulgur pilaf, cooked in aromatic spices, that accompanies a lot of kebab and meat dishes. Bulgur also known as burghul, is like a cereal made from durum wheat. To be honest, I preferred it over rice pilaf and it was a highlight for me, making the simplest of dishes special. Kebabs come in various sizes, shapes and meats in Turkey and there’s so much more to them than the Doner Kebap that seems to attract much attention. 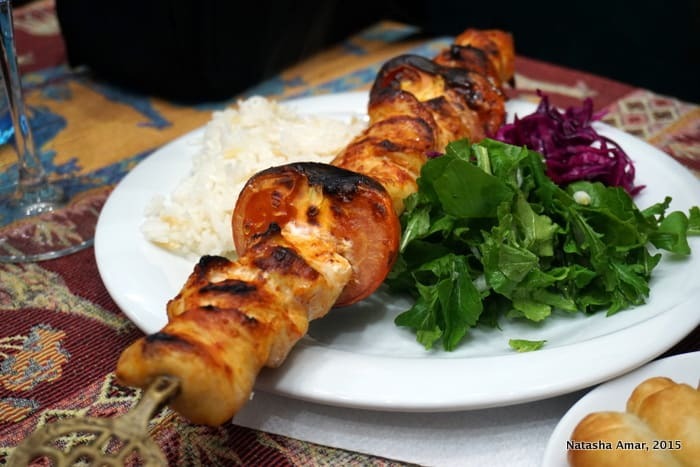 Personally, I love pretty much every kind of kebab I’ve ever tried, including the popular Sis Kebap (or Shish Kebab) that’s made of cubed meat on a skewer grilled in a stone oven. If you find yourself in Selcuk, a popular base for visiting the ancient ruins of Ephesus and the travertines of Pamukkale, make your way to Ejder Restaurant, a rustic and cozy family-run place that serves up delectable traditional meals and warm smiles. 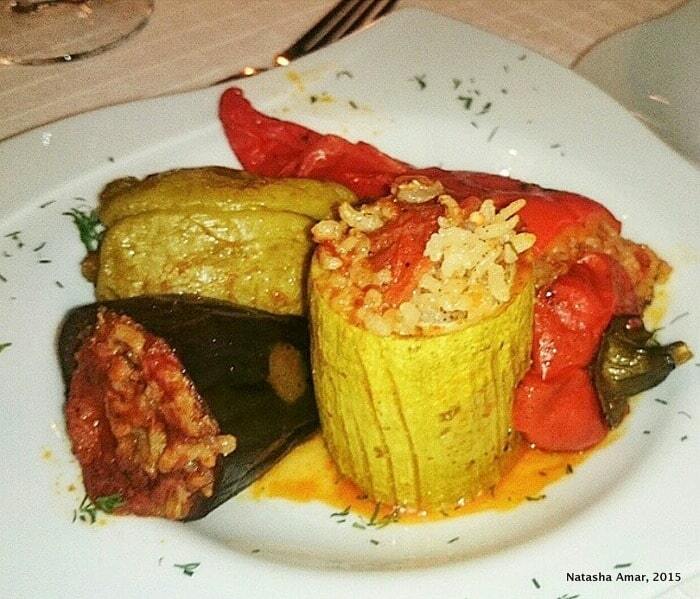 Dolma which literally means ‘stuffed’, is a popular main dish of vegetables like eggplant, courgette, tomatoes or peppers stuffed with cooked spicy rice and ground meat. I first tried dolma in Cappadocia at this great restaurant called Seten in Goreme (another favorite) and loved the explosion of flavors in my mouth. It also brought back fond childhood memories of this one dish my mom used to make, of cooked green and red peppers stuffed with minced meat. 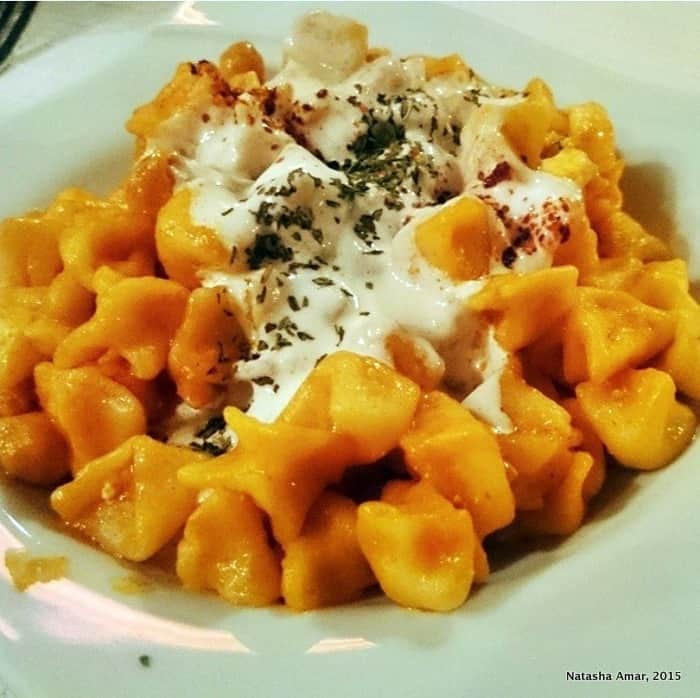 Manti is Turkish pasta or folded pockets of dough stuffed with meat and cooked with spices and olive oil in a yogurt and garlic sauce. Vegetarian versions are hard to come by but are served at some restaurants. As is usually the case with a pasta dish done right, Manti makes for a very satisfying meal. I was no stranger to this Middle Eastern dream of a dessert that is much loved here in Dubai. A crispy soft cheese filled pastry that’s dipped in sugar syrup, topped with pistachios and smells like roses, Kunefe, to me is the queen of all desserts. 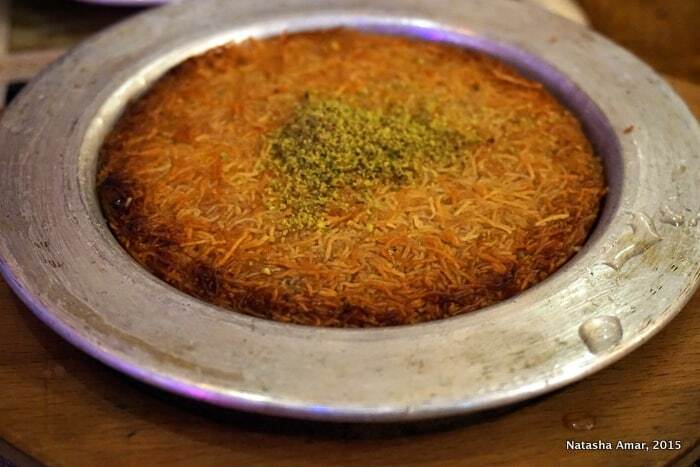 I’ve said it before here and I’ll say it again, if poetry could be a dessert, kunefe would be it. 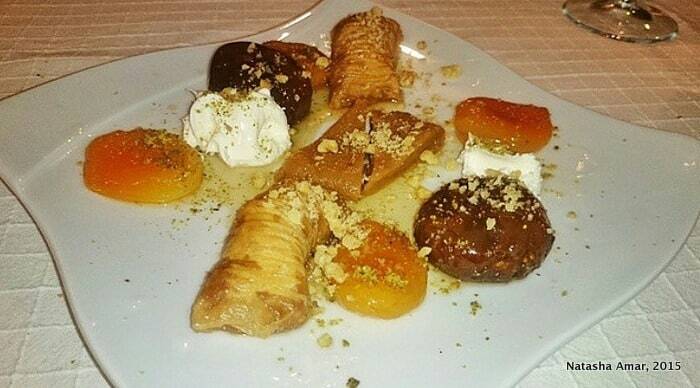 Also familiar from Arabic cuisine, Baklava, a filo pastry filled with chopped nuts and held together with honey or sugar syrup, and Helva, a semolina based dessert were among this heavenly platter served at Seten Restaurant. The other stars of the show were the dried apricots and figs soaked in sinful sugar syrup with dreamy dollops of cream, all topped with crushed pistachios. 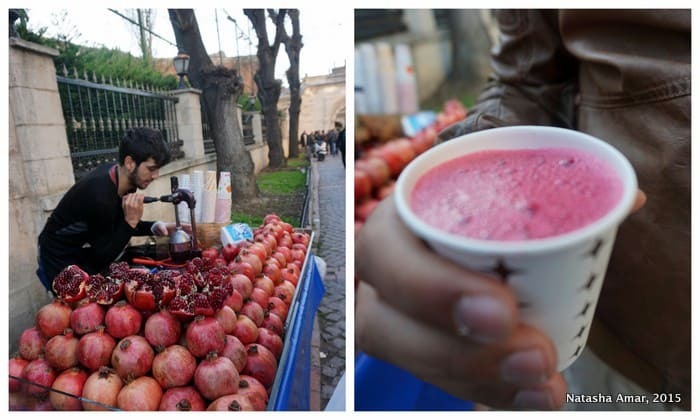 Pomegranate juice vendors are everywhere in Turkey and just what you need while hiking in Cappadocia or exploring Istanbul on a hot afternoon. So it’s pretty obvious from my photos that Turkey is a great destination for food lovers and who doesn’t love food? 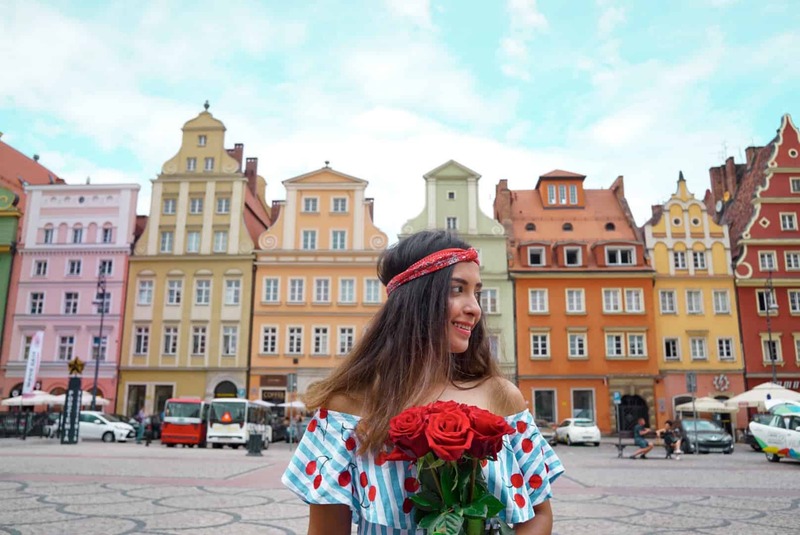 The country is also good to vegetarians with mezze and main dishes made of vegetables like eggplant, squash flowers, courgette, zucchini, carrots and peppers. 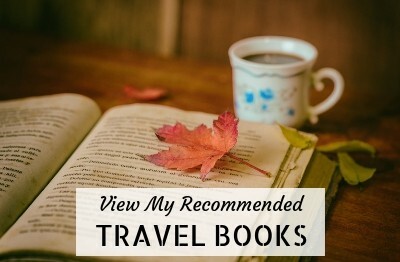 For general advice on planning your trip to Turkey and itinerary suggestions (including popular spots such as Ephesus, Cappadocia, Istanbul and Pamukkale), check my Turkey travel blog. 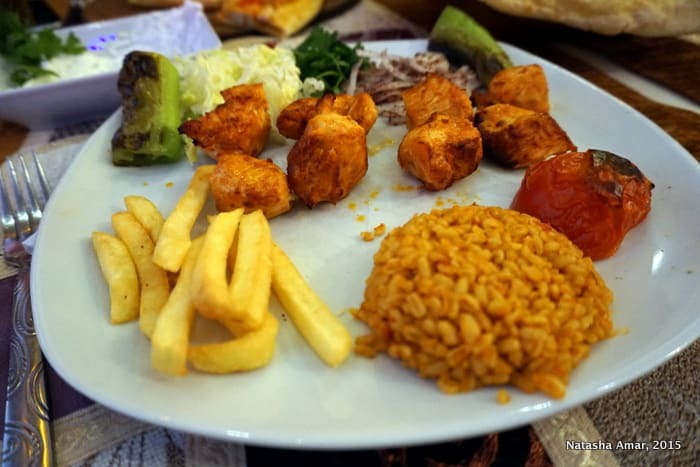 Have you tried Turkish cuisine or would you? If you have, how did you like it and what is your favorite dish? Thank you! I’d be interested in reading about it, I love street foods. 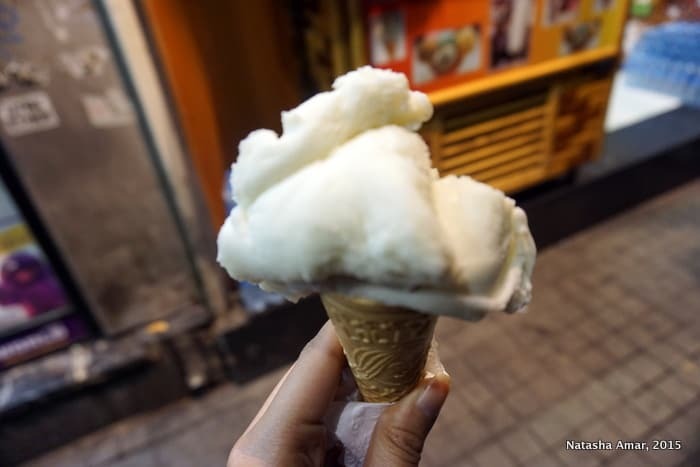 When I tried an ice cream in Istanbul (Laleli area), I was told that it was made out of donkey’s milk. I can’t tell for sure if it was Dondurma or not, but the taste was great! Actually, I’ve tried and eaten 80% of these, Pide was delicious as well. When we went to Turkey a few years ago, I wasn’t sure I would like the food, but I was WAY wrong. Everything we ate there was delectable. The pide and the Doner Kebab were my favorites, but we really just loved everything, as I can see you did as well. Love it. Oh yes and plenty of nice Pide places in Istanbul. Kunefe IS awesome! I had a phenomenal kunefe overlooking the dead sea and that fresh pomegranate juice looks incredible. The food looks amazing, especially the sweets! I can’t wait for my trip to Turkey. 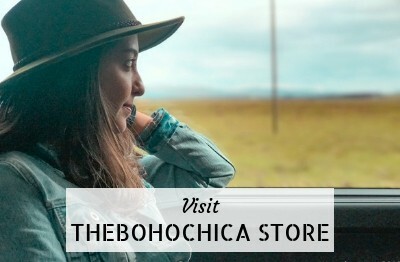 The food was a big highlight for me Erica, I’m sure you would really enjoy it 🙂 Thank you for connecting on FB, I’ve liked your page too. Uh oh, now I’m drooling. I just love pomegranate and can’t understand why I didn’t try the juice as like you say, the vendors selling it are everywhere. That kunefe looks amazing! LOVE this – it made me hungry and ready to head back to IST! Thank you! Turkish food is the best! I just visited Turkey recently as well and highlights for me was the Testi Kebab and the Imam Bayildi (stuffed eggplant). Was really surprised with the array of vegetarian options!